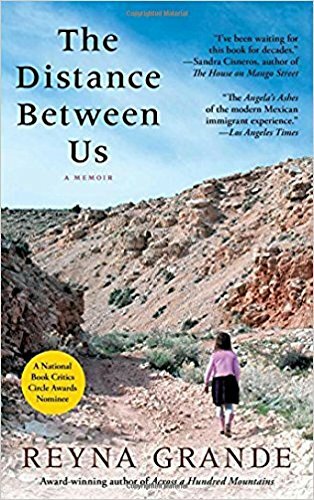 The Distance Between Us is a first-hand account of an undocumented immigrant’s journey from Mexico to the U.S. It describes the author’s life growing up in Mexico in two very different grandmothers’ homes and her eventual border crossing with her father and two siblings, followed by her life in America, “el otro lado.” Life wasn’t easy for Reyna in either country, but there was a stark contrast between the bamboo shack she lived in with her maternal grandmother and the comparatively spacious apartment her father and stepmother owned in California. When she goes back to Mexico for a visit after living on the other side of the border, she has a hard time believing she once lived there, that that was her daily reality. As an adult, she knows with frightening certainty how different her life would have been if she hadn’t come to the U.S. This book doesn’t read like most memoirs—it’s very structured, for one, and fairly strict with chronology. The language is simple and straightforward, almost childlike. After reading an interview in which Grande explained that her goal was to tell the story through the eyes of the child she was, her chosen style made sense to me. Grande consciously chose not to impose her adult self into the narrative very often, which gives her impressions and reactions a very immediate feel as opposed to the distance created when memoirists analyze their experiences with the benefit of hindsight. Favorite bits: I think what most impressed me was Grande’s determination. She has no time for negativity—she has too many things she wants to accomplish. I especially loved following her journey through school as she developed her writing. Even though she moved on to more highbrow literature later in life, it gave me a tickle that one of her favorite authors in high school was V.C. Andrews, as I also remember the eyebrow-raising thrill of discovering her books. And the time she spent with her paternal grandmother Evila (so perfectly named she could be a Disney villain!) was wrenching, but also…I couldn’t wait to see what she was going to pull next. The woman was creative in her cruelty.